HOW THE ELEPHANT WAS SOLD! Putting Tuesday 15th January 6pm In Your Diary! | Southwark Notes - whose regeneration? HOW THE ELEPHANT WAS SOLD! Putting Tuesday 15th January 6pm In Your Diary! Posted on January 12, 2013 | Comments Off on HOW THE ELEPHANT WAS SOLD! Putting Tuesday 15th January 6pm In Your Diary! Next Tuesday 15th January 2013 will see Southwark Council’s Planning Committee gather at their Tooley St offices to rubber-stamp Lend Lease’s Masterplan for the Elephant and Castle area. They have already issued a press release about why the Masterplan needs to be approved and all the total unaccountable crud and spin that goes with it – making mixed communities, more money for affordable housing, new parks, new this and new that. There will be some kind of debate amongst the councillors on the committee and 5 minutes in total have been allotted for public objections on the biggest planning application ever received by Southwark. It’s taken a long long time to get this far. A really long time. We and countless others have been arguing against this form of regeneration of the local area for a long time too. We urge everyone who feels uncertain or pissed off about this monster rip-off to read the collective response to the Council below from the three brave local folks who will be standing up in the five minutes to give their best shot in making someone in the council see sense and vote NO to this scheme. We are representatives of local groups who have objected to the above applications. We propose to speak on behalf of these groups at the planning committee meeting next Tuesday evening, 15th January 2013. We have the following concerns and objections which cannot be fully aired in 5 minutes. We have therefore listed them and trust that you, and your colleagues, will help us ensure that they are fully addressed, by asking questions of us based on these points. References to the ‘report’ are to the officer’s report for the planning applications that recommends approving the scheme. The Heygate Leaseholders Group are losing their homes to facilitate this application. We are objecting to the Compulsory Purchase Order placed on their homes on the grounds that the public benefits of the scheme have been lost. Heygate Leaseholders were promised a retained equity option in assisting them to purchase homes in the new development, there is no such option in the accompanying scheme application. The Leaseholders Group requests that the provision of such an option is a condition of granting both the demolition application and the development application. lack of proposals for interim uses of existing resources of the Heygate estate during the 15 year development period. A possible interim use on the site is Crossway Garden – This walled green space is located towards the north eastern edge of the masterplan, south of Crossway Church. Over the last 2-3 years the garden has cultivated as a nursery bed for fruit trees and bushes. Children from the local Victory Park School have been involved with planting days. Gardening is connected with the nearby Victory Park as part of a neighbourhood gardening initiative and Southwark Green Links. how will the ‘viability gap’ in the scheme be bridged? 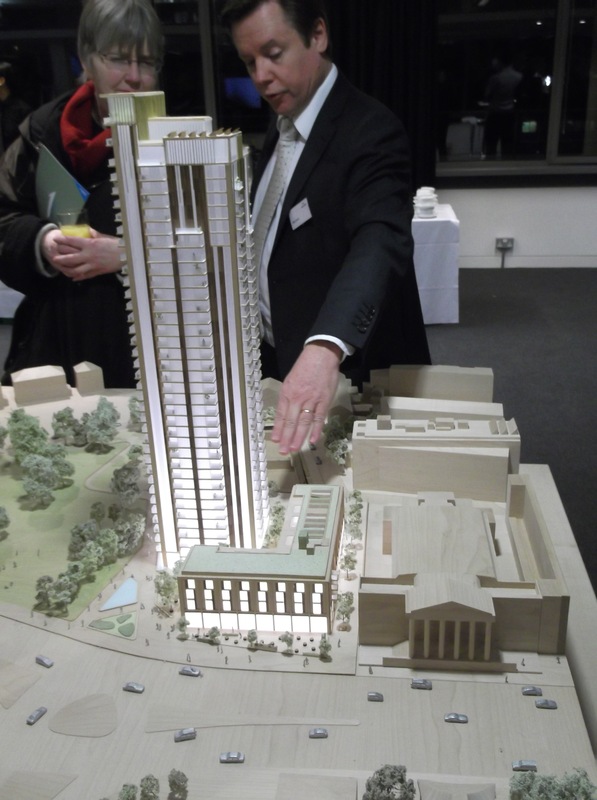 how will we avoid the Heygate becoming yet another stalled development site? The viability of the scheme is described as ‘problematic’ (para. 151) and refers to a ‘viability gap’ representing ‘very big risk’ on the part of the applicant (para. 153). The Phase one Heygate application states: “The level of affordable housing proposed represents a level that is currently above what is indicated as being viable.” Non-viability of the scheme is also listed in the council’s risk register as one of the major impediments to the scheme going ahead. How is the viability gap between the viable level of affordable housing at 9.4% and the 25% (para. 150 & 153) offered being bridged while maintaining the financial stability of the scheme?The 360 London (London Park Hotel) and Oakmayne Plaza (Tribeca Square) sites were granted planning permission six years ago; these sites remain undeveloped. There is no reference to the time schedule for the delivery of the detailed planning applications in the report.We propose that a condition be attached to any approval of the application requiring a fixed schedule of applications. The scheme will provide only 71 social rented units out of a total 2,300 new homes (para. 159). This is in breach of Southwark Council’s planning policy, which would require approx. 400 social rented units. 198 affordable rent properties are also being provided, but they are not affordable for many residents of the borough. Affordable rent is also not a type of social rented housing. Both the National Planning Policy Framework and draft revisions to the London Plan have social rent and affordable rent as separate categories of affordable housing (with intermediate housing as a third category). A consortium of 9 boroughs including Southwark supported this position at the London Plan examination in public in November 2012. Therefore affordable rent units cannot be used to meet the social rented proportion of the affordable housing required by policy. The application should therefore be rejected on these grounds. The first two tranches of the six tranches of the scheme only deliver 20% affordable housing (para. 156). This means that the first 1,200 units of the scheme will only provide 20% affordable housing. This should be changed so that 25% minimum is delivered from the beginning of the scheme. An initial review of the affordable housing delivery is proposed only after two years beyond the first approved application (para. 154). We are also concerned that the conditions for changes in phasing will not be strong enough to ensure that the development is delivered in a timely fashion (para. 35). The residents and shopkeepers of Wansey St, Balfour St, Rodney Rd, Henshaw St, Salisbury estate and Peabody trust will all suffer significant degrees of disruption and inconvenience over many years. There are particular concerns about the impact of the new public square off the Walworth Rd on the amenity of Garland Court and Wansey Street residents. We note the comments made by the Highway Authority that the Estate Management Strategy assumes management of the existing areas adopted by the EMC (Appendix 2 – para. 11). We share the Highway Authority’s concerns and object to the public realm appearing to move into private hands. The development is not free of car parking as originally envisioned and set out as policy by Southwark in the E&C SPD. If the scheme is not to be free of car parking, a condition should be created which sets it at a lower rate than the up to 27% of units having car parking (plus motorcycle parking plus car club places) that is currently being demanded. 616 car-parking spaces are proposed for the scheme (para 225) despite Council policy requiring it to be car free. The Elephant has the highest possible public transport accessibility rating (PTAL 6b) so why are so many car-parking spaces needed? Strata Tower which has been completed has car parking set at 14%, the consented Oakmayne development 11%. Most recently St Mary’s Residential was granted at 16% (8% disabled and 8% private). If parking is to be allowed it should be at a far lower rate. Victory Community Park and the Elba Place nature garden are close by the Heygate estate. Both are Sites of Importance for Nature Conservation (SINC) and the Elba Place nature garden is used by the Victory School – both are rich in biodiversity. There are serious factual inaccuracies in the Ecology Implications section of the report. (paras. 312 – 319). We do not believe any assessments have been made of the sites relating to the impact of the proposed development. The data reported in the environmental statement is out of date, incomplete and inaccurate, and does not allow baseline assessment of the potential adverse effects of the development. Southwark’s own plan 12.31 policy 3.28 does not permit damage to SINC’s in order to facilitate development, and requires mitigation and compensation for any damage to biodiversity. This application does not meet those requirements. These RPA surveys should be carried out now and a firm commitment given to retention of trees. A greater number of trees should be considered for retention, especially those on the north side of Heygate St. for which there appears to be no clear grounds for their removal. This scheme was chosen by Bill Clinton as a global example of zero carbon development. The scheme aimed to produce enough on-site renewable energy to supply the entire Elephant & Castle area. This aim has since been abandoned and the application fails to propose any on-site renewable energy whatsoever, contrary to Southwark’s policy which requires 20% minimum. We propose that the 20% on-site renewable energy requirement is met using a combination of the alternatives listed in paragraph 406. We note the report’s comment that through planning permission additional plant can be installed to accommodate additional capacity (para. 404). We request that a planning condition is applied upon granting the application accordingly: The new Energy Centre should be constructed such that it has sufficient capacity to supply all of the surrounding developments as identified in the Energy Strategy. The cycling proposals fail to take sufficient account of the deaths and injuries cyclists have suffered around the Elephant and Castle. It is proposed to widen the northern roundabout, which will increase traffic flow. The new cycle connection suggested between Brandon St and Meadow Row is not more ‘direct’ as the officer’s report claims, and ignores the key connection with the crossing at Falmouth Rd. The Heyate comprised a total of 2,500 sq metres of community facilities; the scheme proposes a minimum of just 1,000 sq metres. The minimum should be increased to 2,500 sq metres so that there is not net loss in community facilities. The transport infrastructure spend is still insufficient to fund improvements to the tube station and northern roundabout. will the London Living wage be paid for employment on scheme? There is no information on how many of the affordable retail units will be available for displaced local retail businesses. Those employed in construction jobs on the scheme should receive at least the London Living wage. We note the minimum construction jobs target for local residents (para. 376) We would like to see a similar minimum target for local residents post construction (para. 135). A definition of the area of local benefit is also needed. We note that the legal agreement will secure 10% of affordable retail space which will be prioritised for existing SMEs in the E&C OA. However, it is understood that this may be limited to a term of just 5 years, thereby failing to provide long-term security for small retailers. The footprints of the ground floor retail spaces are considerably larger than that of many of the surrounding local businesses. The building form should create a larger number of smaller units. This would increase permeability, enrich the public domain and encourage local businesses to connect with the development. The area around the base of the Strata tower is an example of how the public realm can become marginalized through the impact of tall buildings. The scale, height and massing of the proposed development should be reconsidered. The proposed cafes around the green space may not be affordable to all local people, and will therefore fail to create a truly human sense of place and inclusiveness for the neighbourhood. Smaller scale community focused businesses should be integrated within the proposals. This entry was posted in Uncategorized and tagged Council Housing, Displacement, Elephant & Castle, Elephant and Castle, Gentrification, harga yang terlalu tinggi, Heygate, Lend Lease, One The Elephant 價過高, Regeneration, Rip-Off, walworth. Bookmark the permalink.